NTU Visual Arts Society News Blog: ANIMATION REVELATION - Howl's Moving Castle and the two Gurren Lagan movies! 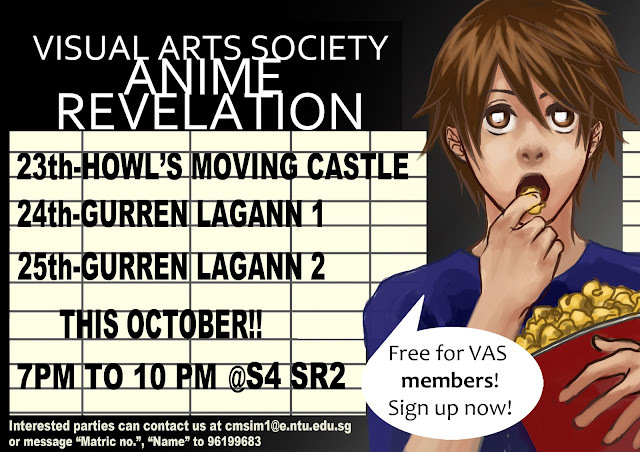 ANIMATION REVELATION - Howl's Moving Castle and the two Gurren Lagan movies! The VAS AnimeWorks is proud to bring to you three excellent animated movies this October 2012 -- "Howl's Moving Castle", "Gurren Lagann: Childhood's End", and "Gurren Lagann: All the Lights in the Sky are Stars" ! Not yet a member of the VAS? Not to worry! Just drop by our publicity booth happening tomorrow at Canteen B and next week at the North Spine, beside 7-11. Membership is $2 a year, and you get free access to all of our anime movie screenings! Gurren Lagann: Childhood's EndOn the surface of the world Beastmen reign supreme, following the dictates of the Spiral King to ruthlessly eliminate any humans who dare ascend to the surface. So long has humanity languished underground, in fact, that some believe the surface to be a myth. Not Kamina, boisterous leader of a group of malcontents he calls Team Gurren. His determination to reach the surface gets a boost when a face-shaped mecha called a Gunmen crashes through the ceiling of his underground village one day, with the halter top-clad, gun-toting babe Yoko in hot pursuit. Kamina's timid friend Simon the Digger has also found a buried Gunmen and the key to activate it, which allows him, Kamina, and Yoko to defeat the original Gunmen and “pierce the heavens” with Simon's drill.” Thus begins an epic adventure to form a team of like-minded discontented humans who will rise against the Beastmen, steal their Gunmen out from underneath them, and challenge the might of the Spiral King and his powerful Generals head-on. Along the way tragedy strikes, but the arrival of a princess no longer content to be one of the Spiral King's dolls helps Simon to rise to his full potential and lead Team Dai-Gurren to glory. But the Spiral King himself still awaits. . . Although still young, Simon the digger has already accomplished many things: he's ventured forth from his underground village, taken command of the giant robot Gurren-Lagann, and defeated the tyrannical Spiral King. The surface of the planet is once again a safe place to live, and the people of the underground are quick to colonize it, building massive cities with advanced technology. Seven years later, however, an unprecedented disaster befalls humanity: their advanced progression has awakened a mysterious race known as the Anti-Spirals. Without warning, the Anti-Spirals take away Simon's lover Nia, rain destruction across the surface of the planet, and threaten to destroy all life-forms on it. Now disgraced and imprisoned, Simon must overcome his guilt, bring his old friends (and some enemies) together, and surpass the limits of Gurren-Lagann's powers in order to save the world—if not the entire universe.